Our series plotting Woolwich Arsenal’s move from Plumstead to Islington 100 years ago continues. On Saturday 21st September, the first team ventured north to play Sheffield United. Arsenal’s mis-firing front line was once again changed. McLaughlan returned to the team and Randall came in for his first game of the season; Flanagan and Payne making way for them. The Sheffield United team contained two players that would go on to play for Arsenal following the move to Highbury. Bob Benson would die in tragic circumstances during a wartime game in 1916 whilst Wally Hardinge would claim fame as a dual international at football and cricket. Both teams started the game without a win between them, although United had played only two games to Arsenal’s four. Percy Sands won the toss and elected to have United play with the sun in their eyes. From the start the home team pressured the Arsenal goal and their midfield played high up the pitch. So much so that the Reds struggled to get the ball out of their own half. However, Arsenal’s defence was well-disciplined with Shaw in particular playing well against Hardinge. After 13 minutes, against the run of play, Greenaway broke down the right wing and, from almost on the corner flag, put over a cross which beat the goalkeeper and looked to be going in. Just to be certain, Randall added a touch into the empty net. 1-0 to the Arsenal! Shortly after the goal United were reduced to 10 men as Smith was injured. They obviously didn’t think that Arsenal’s attack was up to much and played with one full-back rather than bring one of the other players back into defence. It proved a big mistake as Randall netted again after 20 minutes. Crawford continued to impersonate Manuel the morris dancer and was again caught out of his goal. Luckily for Arsenal Leafe crossed the ball rather than take a shot. McLaughlan then had a weak shot and Winship grazed the crossbar. Real end‑to‑end stuff. Smith returned to the fray and the first half petered out with both teams each creating a number of half-chances. They crossed over with the score Sheffield United 0 Woolwich Arsenal 2. The second half started with a number of players coming together and having to be treated for their injuries. Gillespie and Ritchie both had shots that Crawford easily stopped whilst Common did the same at the other end. Smith finally succumbed to his earlier injury and left the field after 65 minutes. Peart picked up an injury whilst chasing the ball with Leafe. However, he managed recover enough to continue. Greenaway tested Mitchell with a good shot but Common didn’t seem to have his shooting boots on and fired a couple of shots wide. With the home fans getting on the backs of the United players, Arsenal took advantage and McLaughlan put the game beyond doubt after 79 minutes. Greenaway had a good shot punched away and then Common shot wide yet again from the resulting corner. United immediately attacked from the goal-kick and, following a scrimmage in the Arsenal goalmouth, Leafe gained a consolation goal. With just one more attempt on goal, the game finished Sheffield United 3 Woolwich Arsenal 1. Writing for the Woolwich Gazette, Red Rover was still pessimistic after the win. The big test would be whether another two points could be gained the following week against Newcastle. With the first team at Sheffield, the reserves entertained their soon-to-be-neighbours, Tottenham, in the South Eastern League. The Kentish Independent and Woolwich Gazette both felt the crowd of 3,000 should have been more. By the end of the season the first team were struggling to draw crowds of this size. 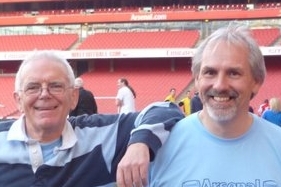 Robert Evans, an amateur from North London, made his Woolwich Arsenal debut. McEachrane and Hanks returned to the team in place of Graham and Calder. Tottenham failed to take advantage of the strong wind in the first half and they crossed over with the score 0-0. After a prolonged spell of Arsenal pressure at the end of the second half, Hanks scored the only goal of the game in the closing minutes. This was his fifth goal in three reserve games. 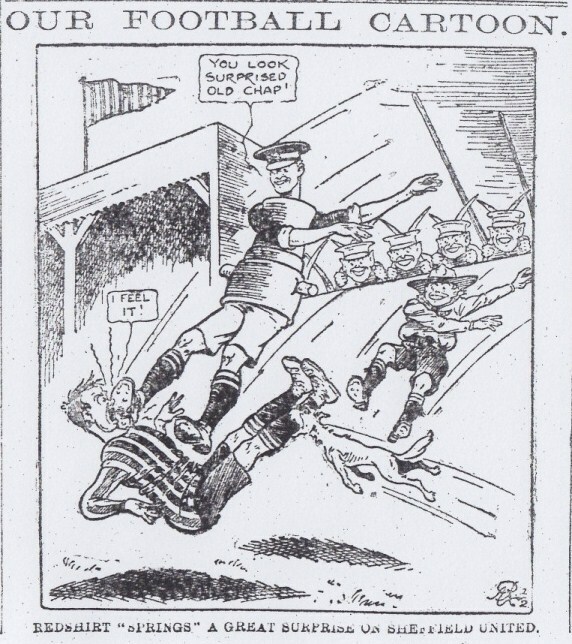 On the following Monday, the first team played Clapton Orient in the first round of the London FA Challenge Cup. This competition was instigated in 1908 after the London FA, following pressure from the English FA, finally allowed professional teams into their organisation. This cup was for London’s professional teams and selected amateur teams that would provide suitable competition. In the previous four seasons, the furthest that Woolwich Arsenal had progressed was the semi-final on one occasion. Arsenal played its first team (and the occasional reserve player) until the 1929-30 season. After this, they put out the reserve team, although they fielded a strong team in 1961-62. I’ve read two reasons for this: firstly that the London FA insisted that all teams did so and secondly, that Arsenal were just plain desperate to win a trophy during the barren spell between 1953 and 1970. If the latter was the reason it certainly worked as they went on to win it. Arsenal’s last season in the competition was 1973-74. The Orient team included Ned Liddell who would join Arsenal in 1914, and played a major part in the downfall of Henry Norris. I sometimes wonder if the two had had a falling out leaving Liddell with an axe to grind. Orient were the holders and 3rd in the Second Division at this moment in time. Arsenal had the better of the early play showing better technique than the lower leaguers. After 22 minutes Alf Common opened the scoring with a “splendid shot” from 25 yards. Shortly afterwards a skewed clearance by Joe Shaw resulted in a melee in front of the Arsenal goal from which McFadden equalised for the Os. Half-time came with the score 1-1. The second half started with Orient having three shots in quick succession that tested Wilson. After 50 minutes, Parker emulated Common and scored with a long range shot putting the home team in front. Randall headed in from a corner to equalise. Mclaughlan and Common then wasted two chances: one from five yards out and a one-on-one with the goalkeeper that was blasted over the bar. Arsenal started to tire and Dalrymple scored with another long range shot with five minutes to go to put Orient in the lead again. Even then the Os were not satisfied, they managed to win another six corners and penalty. Wilson saved McFadden’s spot kick but Dalrymple followed it through to secure a 4-2 win. At least it gave Arsenal an opportunity to concentrate on their league position. It seems that the win at Sheffield took up all of the local journalists’ vigour as there was no other club news reported that week. However, Tottenham director Thomas Deacock resigned. He will feature again later in the season. 2 comments to 23rd September 1912 – Crisis over? Keep the weird cartoons coming, Andy. Excellent article and very interesting – thanks!